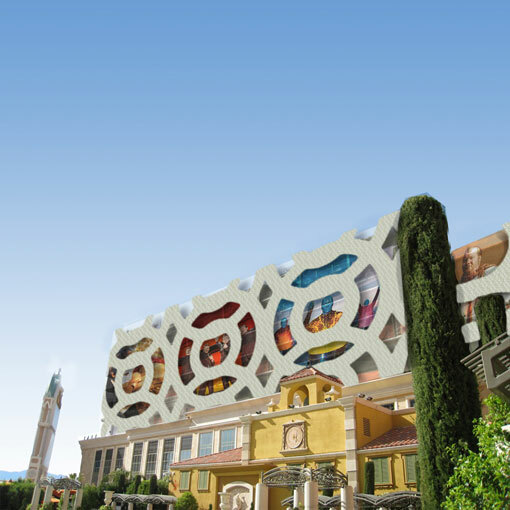 The Palazzo Condo Tower is part of the larger Palazzo Resort Hotel Casino property and was under construction when the project was halted. JZA+D was enlisted to create a solution to mask incomplete construction from view. It was expected that the tower would need to be masked for 3 to 6 years. Investigating the best systems and installation techniques available, in order to provide budgetary numbers and develop a project timeline, we recommended a scrim with cabling and scaffolding system. The fabric scrim is approximately 90 feet high and is suspended 6 stories above ground. JZA+D presented the client with two photomontages depicting the scrim with graphics in relation to the completed part of the tower. 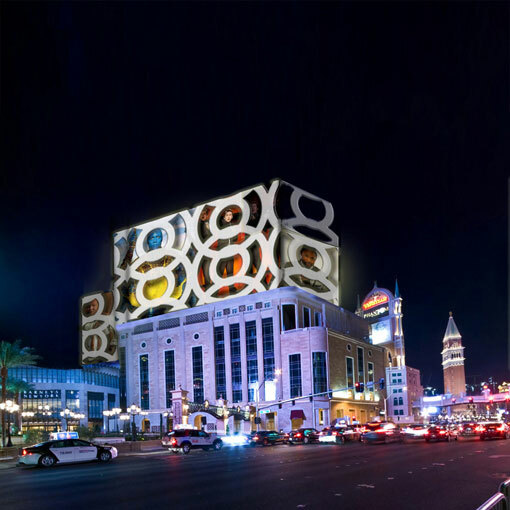 The solution also offered the client the opportunity to up light the scrim and use it as a advertising tool featuring events and entertainers at the complex.